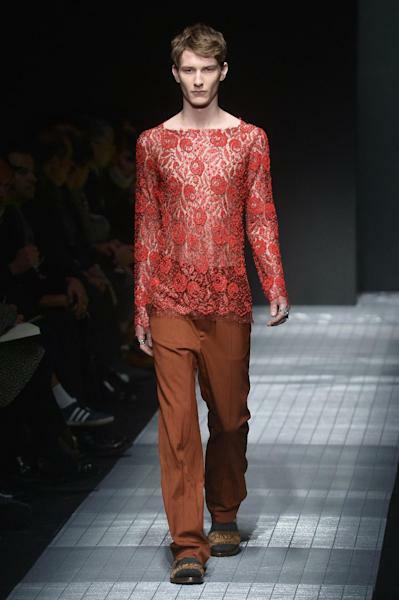 Gucci, Etro and Emporio Armani all showed new Fall/Winter collections Monday in the Italian fashion capital. Frida Giannini's departure ahead of schedule created plenty of buzz for the Gucci show, and fashionistas weren't disappointed. The brand's design team, led by heir apparent Alessandro Michele, took the collective bow at Gucci. From the double 'G' belts celebrating the house's founder Guccio Gucci, this was a show all about reworking the codes of the house for the 21st century. First up, androgeny: there were bows on blouson tops (some featuring retro prints and some semi-transparent solid colors) with 3/4-length sleeves falling high up the forearm, copious rings on fingers and luxe astrakhan fur touches. Next was post-modernism: contrasting army parkas with Americana suiting and shirting worthy of Gram Parsons. Casual pants fell long and broke onto fur-lined loafers or sandals, or they remained wide-legged but were elaborately cuffed. It was a mesmerizing taste of things to come. 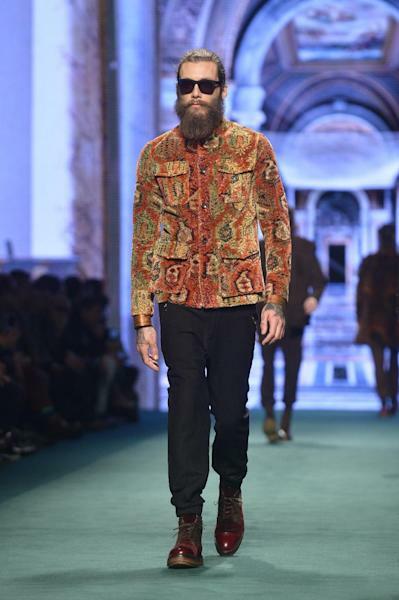 Creative director Kean Etro went on his usual safari of prints and patterns, focusing this season on corduroy and animal hide coats, and lending proceedings a hint of psychedelia with an Arts and Crafts movement flavor. There were plenty of reworked paisley and carpet patterns, long wrap scarves with prints, herringbone tweeds, gingham and plaid shirts, and lots of suede and velvet. Etro's man has always been a luxe-adventurer, and this season was no different, with functional pockets dotted over the winter jackets. Models were shod in three-tone boots that matched the color palette of the collection, as well as simple derbies. The 80-year-old designer was inspired by Japanese calligraphy for the needle-punched paintbrush stroke effect on a wool coat (which returned in a metallic thread on later tweed pieces). 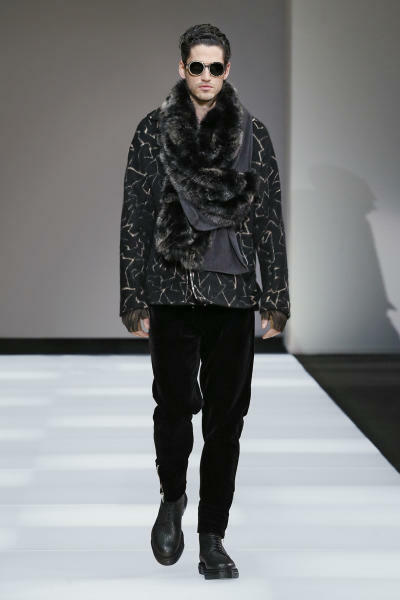 He also sent out dyed furs worn with velvet pants (another trend that looks set to stick), zippers on pantlegs, shirts and asymmetrical biker jackets, as well as rib-knit jogging bottoms (also seen at Versace). Hats were half Soviet sergeant, half hipster beanie and contrasted with the collection's plethora of dark leather pieces, part of a mostly brooding color palette occasionally punctuated with a few camels and caramels. The final flourish of formalwear featured tighter cut suiting and a series of sharp cardigans.